The most common fixture for the ceiling is overhead lighting. Ceiling Lighting in the center of the room is bright and practical. The fixture takes up no floor or surface space like lamps do and provides more light than sconces. The flip of one switch and the whole room is lit. There are some cases when extra lights may be needed. A room with an alcove or odd-shaped corners will need targeted light to eliminate shadows. This can be done with a mini pendant light, a wall lamp that extends out or folds up, or a small sconce. A ceiling fan is ideal for moving air around the room. It makes the room warmer in winter and cooler in summer, which helps control utility bills. 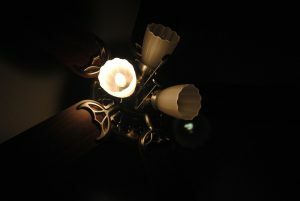 If there is only room for one ceiling fixture, some people opt for a fan and use lamps for lighting. The most convenient way to accommodate a small ceiling it to browse the many sizes and styles of ceiling fan with lights combination. This eliminates the issue of deciding between the two. Although the combination is practical, it does not have to be boring. The choices range from simple to extravagant. A basic fixture will have traditional rectangle blades and a dome light. There are some fans that can be blended into the decor. A fixture for the lanai overlooking the garden can have blades in the shape and color of leaves, with the light section resembling the center of a flower. A fixture for the bedroom of a child is colorful and fun. An airplane, a space ship, licensed superheroes, and animals are all examples of the fan and light combination. If local stores do not offer unique or fun fan and light fixtures, go online to browse through many more possibilities. A dual switch on the wall is common. One starts the fan and the other turns on the light. Pull chains hanging from each component is a popular way to turn things on and off as well. Some lights and ceiling fans with remotes are offered for added convenience. It is important to make sure each feature can be operated separately when placed in the home. A combination fixture with one switch or pull chain means both have to on at once. This will not work well at home. There will be times when the light is needed, but the fan is not, or the other way around. Newer types are almost all manufactured to operate separately, but double check before making a purchase.